Feeding birds is a fun, relaxing activity. But you want to feed the birds – not the squirrels. If neighborhood squirrels are invading your bird feeders and eating all the birdseed, we can help. We’ve found our top three favorite squirrel proof bird feeders. We’ve also created a bird feeder guide that will help you make an informed purchase. The type of feeder you buy will influence the variety and frequency of birds you’ll see. Did you know that birds aren’t the only backyard animal you’ll need to consider when selecting a feeder? Because wherever there are bird feeders, squirrels are sure to follow. To be honest, we think squirrels are pretty cool. Some squirrels can jump up to 20 feet. Other squirrels can run up to 23 miles an hour! There are over 200 different types of squirrels, and they can be found on every continent except Australia and Antarctica. But you don’t want squirrels eating from your bird feeders. Squirrels will scare off the birds. They’ll also typically damage the feeder. Once squirrels gain access to the birdseed, they’ll gorge. In most cases where squirrels and birds eat freely from the same feeder, the squirrels will eventually eat the majority of the food, and the birds will go away permanently. So even though we like our friends the squirrels, we recommend that you use a squirrel-proof bird feeder. 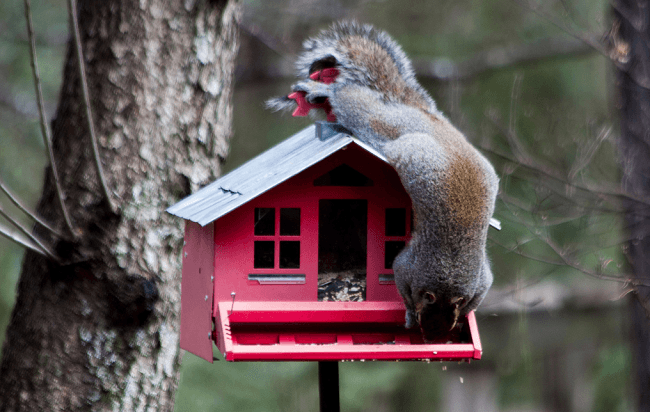 Do squirrel proof bird feeders really work? The answer depends on which squirrel you ask. Many companies claim to offer a squirrel proof bird feeder, but soon enough a squirrel will have found a way to get inside. This is a large plastic dome that rotates upon contact. Baffles are placed on wires or poles. They prevent the squirrel from reaching the bird feeder entirely. When the squirrel climbs onto the baffle, he’ll be spun around and back to the ground. You can buy a feeder with baffles already installed or even make your own from used plastic soda bottles. A homemade squirrel proof bird feeder is an inexpensive option. Note that in most cases; however, you’re going to get better results with pre-made baffles. This is a lever on the feeder that controls access to the seed. It’s controlled by the weight of the animal. When a bird perches on the lever, the seed ports are open. When a squirrel sits on the lever, however, the seed portals close. The weight threshold is usually adjustable. This isn’t usually something you can build yourself, so really your best option here is going to be a feeder your purchase with this mechanism. Which Squirrel Proofing Method is the Best? Squirrels are a crafty, acrobatic bunch. So there’s no one way to stop them. While both baffles and weighted-seed access are effective methods, the layout of the yard is also important. Squirrels can jump, climb and seemingly defy gravity. You want to put your bird feeder at least eight feet from any branches, structure, wire or anything else a squirrel can climb onto. Don’t worry if this takes some trial and error on your part. Those squirrels can be pretty clever! You might have to move your feeder a few times until you find the perfect spot. There are a lot of bird feeders on the market. Don’t worry – we’ve done our research. These three bird feeders are the best of the bunch. They’re durable, beautiful, reasonably priced and have high customer satisfaction ratings. Even better, they each have a system that effectively prevents squirrels from eating the birdseed. 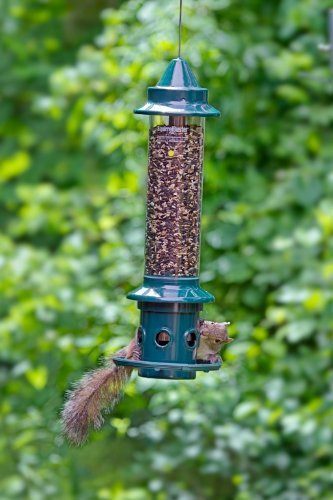 Brome is a popular manufacturer of bird feeders, and the 1057 Squirrel Buster Standard is one of their best-selling models. 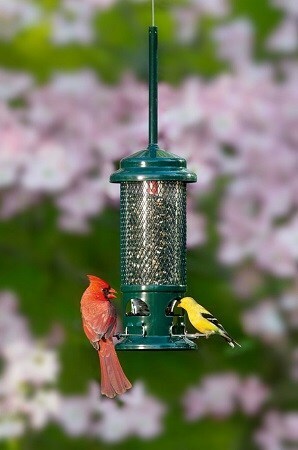 This feeder is only about $35 but offers features normally found in much more expensive feeders. The 1057 attracts many different types of clinging and perching birds. Depending on your area, you might see American Gold Finches, Cardinals, Chickadees, Rose-Breasted Grosbeaks, White-Breasted Nuthatches, Indigo Buntings, Purple Finches, Hairy Woodpeckers and more. But you won’t see any squirrels. Keep squirrels away so the birds can feed in peace. Openings in the bottom section provide birds with access to the seed tray. When a squirrel climbs onto the feeder, however, the extra weight closes access to the tray, removing access to the seed. Squirrels are smart and agile. The 1057’s negative grip tube prevents squirrels from defeating the seed saver technology. Basically, the squirrel is unable to grab the wire with its hind legs and then hang upside down on the feeder to reach the seed (never underestimate the abilities of a hungry squirrel). This unique material adds a powerful layer of durability. RoxResin is waterproof; rust proof and UV stabilized. You can even run the feeder through the dishwasher! This feeder is built to withstand the extremes of all seasons. The 1057 can be placed pretty much anywhere. You can hang the feeder with wall brackets, branch hooks, extension hooks or even place it on a freestanding pole. For best results, you’ll want at least 16 inches of clearance around the feeder. This prevents any acrobatic squirrels from reaching the seeds without having to place weight on the feeder. If the squirrel is forced to climb onto the actual feeder, the Squirrel Proof technology will block their access to the seeds. The Squirrel Proof technology is very effective at keeping squirrels from eating the seed. At the same time, the feeder won’t hurt the squirrel in any way. You can even adjust the weight limits on the feeder. This works well if you want also to prevent large birds or other animals from eating the seed. This feeder is also built to last. The RoxResin material is highly resistant to both weather and animal damage. Unlike comparable feeders in this general price range, the 1057 Squirrel Buster will last for far longer than just one season. Ventilation ports keep the seed dry and fresh. Customers report fresh, dry seed even in extreme conditions such as excessive rainfall and below-zero blizzards. This provides a valuable food source for our feathered friends all year long. There’s not a lot to complain about with this feeder. Unless, of course, you’re a squirrel – then you might not be so enthused about the 1057’s Squirrel Proof technology. It really is one of the most effective (yet humane) squirrel-proof systems we’ve ever seen. The only other negative about this feeder is the relatively small capacity. This feeder holds 3/4 quart of seed. If your neck of the woods has a lot of birds, you could find yourself filling the feeder every day or two. Still, this is a minor gripe. The feeder holds enough seed to feed plenty of birds all day long. Plus, seed can sometimes turn stale when left in a large capacity feeder for a long time. 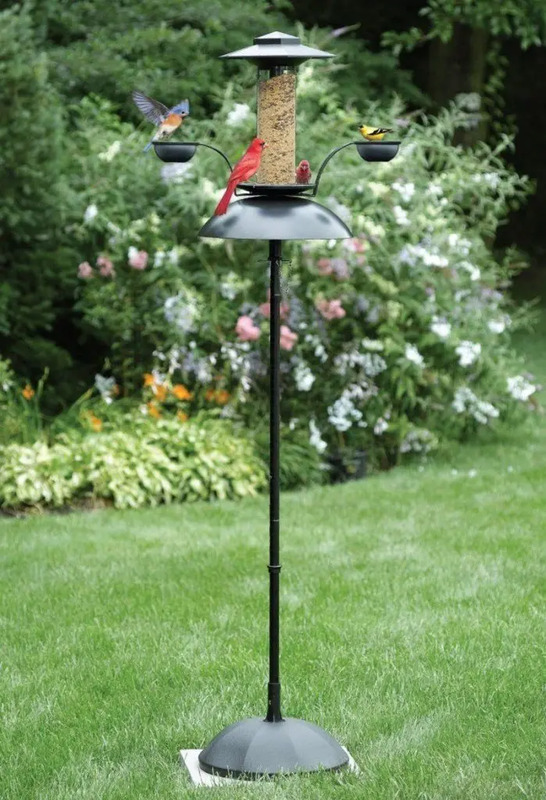 Also known as the Effort-Less Bird Feeder, the Oasis is a gravity-fed, freestanding dispenser that is easy to clean, holds a large volume of seed, and is overall very bird-friendly. Squirrels, on the other hand, won’t find a very hospitable environment here. The Oasis has a squirrel guard and other safeguards against unwanted small animal invasion. The large feed tray attracts a wide variety of birds. Depending on your area, you can expect cardinals, finches, chickadees and more. Aside from the birdseed, your feathered visitors will also enjoy the two water cups on the side. Plus, there’s even a second lower tray to catch any birdseed that falls from the main tray. The feeder stands on an included center pole. With the simple pull of a pin, you can access the seed storage area. No ladders or step stools are required. This is one of the best freestanding feeders on the market. Because the center pole is specifically designed to support the feeder, the unit remains steady on a variety of surfaces including grass and rocks. The base holds sand for weight so that placement won’t damage your lawn. The total height of the feeder is about six feet tall. Still, the base is both heavy and secure enough to withstand strong winds, rain, and snow. The entire feeder (with base) weighs 11 pounds with dimensions of 26.8 by 16.6 by 6.2 inches. A large dome prevents squirrels from climbing the pole. Plus, the secondary feeding tray catches most seeds before they can hit the ground. This helps deter squirrels from hanging around underneath the feeder. The feeder holds over two and one-quarter pounds of seed. This makes the Oasis one of the largest feeders on the market. While refilling is easy, the large capacity makes frequent re-fillings unnecessary. The two side cups store plenty of water. Think of the feeder as a restaurant for the neighborhood birds. Many of them can sit at the feeder side by side while eating and drinking. Plus, they can do so without any interference from the squirrels. This is a freestanding feeder. If you’re looking for a feeder you can hang outside the window or from a fence, the Oasis probably isn’t the best option. The large storage capacity means bird seed runs the risk of getting stale. This really isn’t a fault of the feeder, however. Rather, if you don’t have many birds who use the feeder, the seed can turn stale over time. This feeder is best used in areas where there are lots of birds. 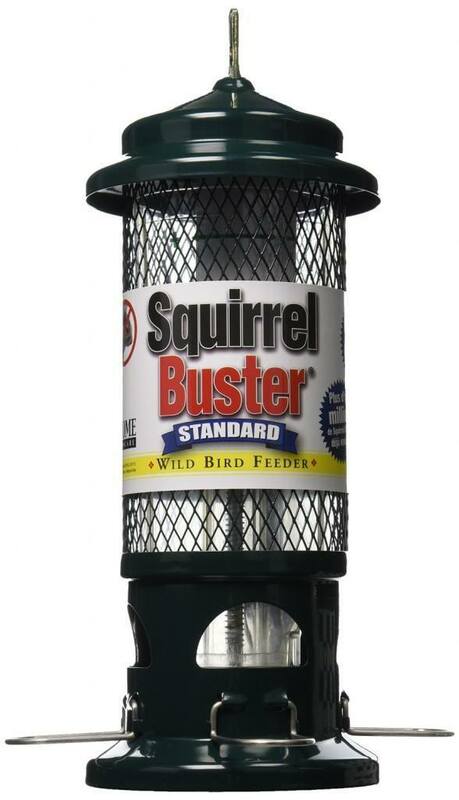 Another great offering from Brome, the 1024 Squirrel Buster is one of our favorite feeders on the market today. 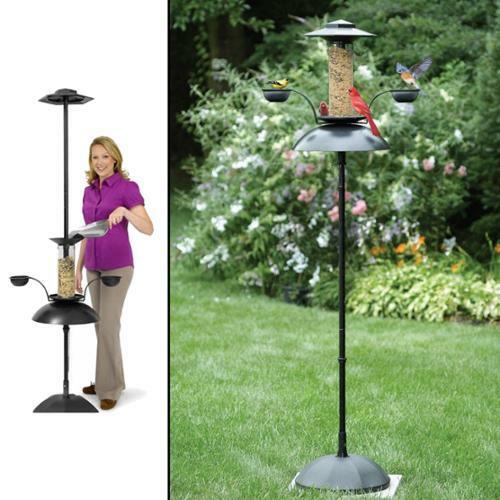 Featuring patented Squirrel Buster technology, this feeder creates a comfortable, safe and inviting space for a variety of different birds. Plus, the entire feeder is backed by a lifetime, hassle-free warranty. The 1024 holds up to three quarts of seed. Black oil sunflower seed is a great choice for most areas, although you might want to experiment with different blends if you’re trying to attract certain local species. The unique design is appealing to a wide variety of chirping and perching birds. Depending on your specific location, this feeder will draw American Gold Finches, Chickadees, Cardinals, Downy Woodpeckers, Indigo Buntings, Rose-Breasted Grosbeaks, Evening Grosbeaks, Purple Finches and more. The included Cardinal ring provides a comfortable perch for any Cardinals in the area. Cardinals won’t turn their heads to feed. The thick, textured Cardinal perch allows these birds to eat from the feeder while facing forward. The bottom of the feeder has seed ports that allow access to the seed. However, whenever a squirrel or large animal climbs onto the feeder, the added weight automatically closes those seed ports. This prevents access to the seed but doesn’t harm the squirrel or other animals. The weight requirements are adjustable. The default setting is about four ounces, which is roughly the weight of a small red squirrel. You can set the weight threshold to allow heavier or lighter animals. The 1024 is easily hung from a wall bracket, extension hook or tree hook. This lets you put the feeder basically anywhere including: over a window, from a tree, off a deck, from a fence, over sliding doors and more. Cleaning is a snap. The feeder can be easily dismantled and run through your dishwasher. Plus, the UV stabilized components help prevent sun damage to the seeds. Seeds stay dry and fresh even in snowy, windy and rainy conditions. RoxResin makes the feeder durable, too. This material is scratch and bite resistant. Not only will it hold up to the elements all year long, but RoxResin also resists all attempts by squirrels to chew, claw or otherwise access that tasty birdseed. At approximately $80, this is the most expensive feeder on the list. However, unlike some of the cheaper models available, the 1024 Squirrel Buster will last for years – even after repeated exposure to wet weather. Also, the feeder is durable enough to withstand the harshest break-in attempts from the local squirrels. We’ve seen plenty of “squirrel-proof” bird feeders that were torn to pieces by a hungry squirrel. The RoxResin material can handle whatever the squirrels attempt to throw at it. Watching birds is a wonderful pastime enjoyed by both the watcher and the bird. With a little bit of knowledge, you can attract birds to your yard all year long. Any of our recommendations will work great for most situations. So order a new feeder today. The birds of your neighborhood will thank you.